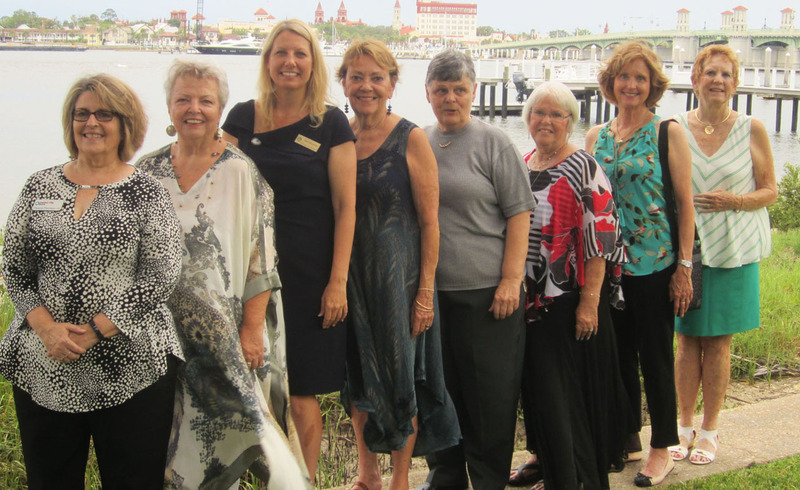 At the June 20 Pilot Club of St. Augustine installation were, from left: Melanie Morrison, Jo Brown, Tadzia Alexander, Sara Hetherington, Vicki Sellner, Rene Naughton, Elizabeth Whalen and Lynne Stephenson. SAINT AUGUSTINE – Tadzia Alexander and Vicki Sellner shared the spotlight June 20, when Alexander was installed as president of the Pilot Club of St. Augustine and Sellner was named Outstanding Pilot of the Year for 2017-18. Sellner’s honor was presented by outgoing president Sara Hetherington during a gathering at the home of Alexander’s grandmother, Emily Alexander. Lynne Stephenson, a past president of the St. Augustine club and newly installed governor of the Florida District of Pilot, conducting the installation ceremony. Sellner, a member of Pilot since 1988, was chosen for her dedication to the local organization, involvement which has included as a member of the board of directors and chairing various areas of Pilot service. Serving with Alexander for the 2018-19 club year will be Jo Brown, president-elect; Anne Heymen, recording secretary; Hetherington, corresponding secretary; Melanie Morrison, treasurer; one-year directors Lucille Barnhill and Sellner; two-year directors Kay David and Rene Naughton; and directors in training Elsie Evans and Elizabeth Whalen. Appointees include Kay Burtin, chaplain; and Sellner, parliamentarian.